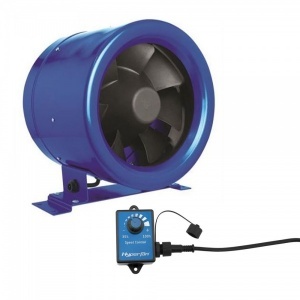 Hyper Fans are the most efficient ventilation fans out there, moving more cubic metres of air per watt of electricity than any other fan in the industry, ensuring that your indoor garden runs as efficiently as possible. They generate ridiculous static pressure levels (beyond anything else out there) and they're super-quiet! They're even supplied with a detachable and fully-adjustable speed controller unit, allowing you to run at between 35% and 100% capacity. Their digital DC motors have been engineered for reliability and should outlast even tried-&-tested workhorses like the RVK range.